While the optimism and ambition that helped create the internet are still plentiful, recent years have seen a rise in the feeling that it has brought both good and bad. Fortunately, and despite dramatic headlines in newspapers and speeches by politicians, it seems that for now it is realism rather than fear that is taking hold. Recent research from the Pew Internet Centre has indicated that numbers of people seeing the internet as a bad thing for society have in fact fallen. Nonetheless, the pressure created by the internet-pessimists does create a sense that ‘something must be done’, if only to to build a more positive image of the Internet and prevent a drift to over-regulation. This is easier said than done. In the past, when action was required, there were governments who could act within their borders to make things happen. The connection between government action, and real-world reaction, was simpler. This is less obvious in a digital world. It raises the question of who should be doing what to rehabilitate the Internet. The focus of this year’s Internet Governance Forum, ‘an Internet of Trust’, implies a desire to take on this challenge. Addressing the issue in an international, multi-stakeholder forum is welcome, creating a possibility to seek ideas and commitments from all relevant actors. However, the focus on ‘trust’ itself raises questions, not least because the French version of the theme – un Internet de confiance – could also be translated as an Internet of Confidence. Is there a difference here? Arguably, yes. 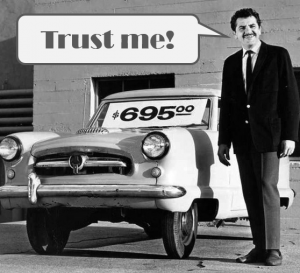 Trust implies that certain actors or processes are certified as being ‘trustworthy’. It is an argument often used by established players to defend their own interests (and market shares), distinguishing them from newcomers (in particular digital ones). Such claims – or demands – imply a centralisation of decision-making about which bits of the internet are ‘good’ or ‘bad’. It risks taking us towards a ‘walled garden’ approach to the Internet of the 1990s, or the filter bubbles talked about today where algorithms help ensure that you only see sources that you agree with (and so are more likely to trust) on your social media feed. Confidence, in comparison, focuses on individuals – consumers, readers, users. Instead of being instructed to trust one site, product or service over another, they have the skills and positive attitudes to make choices themselves. Not to believe that everything is lies, but rather to value the truth and apply common sense in order to find it. Not to be a passive consumer of other people’s content, but rather an active player, creating new ideas, products and services. The risk with an approach based on trust is that responses also tend to be centralised. Governments try to regulate for trust, often clumsily. Standards emerge that tend to benefit the biggest players over newcomers, consolidating their position. Individuals are channelled towards a limited number of sources, believing that anything outside is dangerous. A focus on confidence starts with education. This is a process that begins in school, but, given the progress of technology, inevitably needs to be refreshed throughout life. Knowledge can be shared, and the skills and reflexes developed. This is where libraries come in. Where they are connected to the internet, and properly resourced, libraries are a key part of the infrastructure for building an internet of confidence. With a long experience in giving people the skills to look for analogue information, they have embraced their role of helping users do the same online. In doing so, they have helped make for skilled and confident internet users, from building media literacy among teenagers to giving older users the support they need to interact with eGovernment services. They are a key part of any effort to ensure the fulfilment of the potential of the internet for development, from the personal to the global level. Governments are already investing significant effort in tackling online crime, and it is clear that activities that are harmful for individuals and society should be tackled. However, just as in the real world, legitimate action against criminals should not turn into the creation of walled gardens where everyone else can feel safe. Efforts to build confidence are essential for innovation, creativity and the continued delivery of the progress that the Internet has permitted to date. See you at IGF 2018!